Our 15 mile Lower Gorge Express is an afternoon half day run that is suitable for nearly everyone, from ages 6 to 106, including families, corporate groups, youth groups and scout groups. For the past 30+ years the South Fork American River has served as a perfect introduction to California rafting adventures for hundred of thousands of rafters. The reason for the popularity of rafting on the South Fork of the American River is because it has something to offer everyone. From thrilling rapids to beautiful scenery, historic spots and great camping – they can all be found on the American River. If you are a first time rafter looking for a short afternoon rafting trip to “test the water” or if you simply want a rafting trip that starts in the afternoon then our Half Day Lower Gorge Express on the South Fork of the American River is the perfect trip for you. It also happens to be the longest and best value of any half-day trip offered on the American River. Our 15-mile long afternoon half-day rafting trip begins just below Troublemaker Rapid and once on the river you’ll raft past James Marshall Gold Discovery State Park, where gold was discovered in 1848! This approximately four hour long, half-day river rafting trip will give you about three solid hours of river time during which time you will be relaxing and soaking up the sun, as well as paddling through fun and exciting rapids in the gorge. Your trip starts at 12:00 PM when you meet for your trip at our Deluxe River Camp in Coloma. Once you arrive you will be given a short pre-trip briefing by your trip leader. This will cover what to bring and what not to bring on the raft. After the briefing you’ll walk through our gear cage grabbing and get a lifejacket, helmet and paddle and then you will take a short walk down to the river. Your guides will fit your river equipment to ensure safety, give you a very detailed safety talk and show you how to sit in the raft and how to paddle. This trip starts off with a slower pace with spirited Class 1 and 2 rapids, great for warming up and practicing your paddling. It’s also a great time to swim and relax. So sit back on the boat and soak up the sun! After about an hour and half of mellow rafting its time to sit up and lock your feet in as you enter the Gorge Section on the South Fork. Soon you will be getting very wet, screaming with excitement, paddling as well as laughing your way down rapids like Fowlers Rock, Triple Threat, Satan’s Cesspool, Hospital Bar culminating with your entry onto Folsom Lake. The last few miles of flat water are made easy as the rafts get towed by our Honda Jet Ski. This avoids a long paddle out on flat-water in a typical headwind. Once you are back on solid ground you will jump on our shuttle vehicle and begin a 30-minute drive back to camp and hot showers. Cold beverages and water will be served on your shuttle back to our River Camp. Once at our River Camp you will get an opportunity to view photos of your rafting antics from the past few hours. By 5:00 PM you will be ready to settle back in camp or head off to drive back home or continue onto your next adventure! There are many reasons why American River rafting on the South Fork is one of the most popular river trips in California. 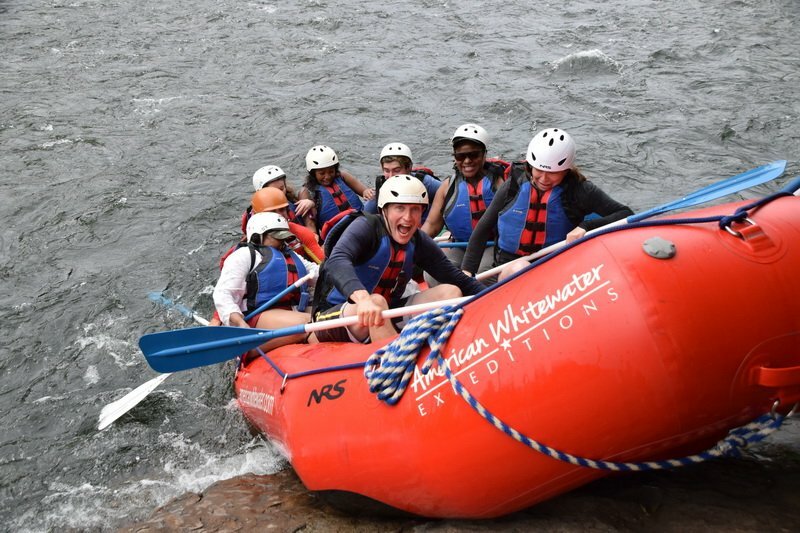 Everyone absolutely loves the experience of rafting regardless if one decides to do a half-day rafting trip or a full day rafting trip on the American River. Keep in mind when other California rafting trips have dried up, the South Fork American River still have guaranteed recreational water flows from the Chili Bar Dam. Even during drought years great recreational water releases are guaranteed and South Fork American River rafting trips are available from April through September. Don’t wait – give us a call at 800-825-3205 and let us show you an absolutely fabulous time on the river. This afternoon South Fork Lower Gorge Express trip is offered every day of the week. This half day rafting trip has a meeting time of 12:00 PM and will depart 12:30 PM at the latest from our River Camp in Coloma. Please click here for Directions Please have lunch before you arrive at our Camp to start the trip. Due to the water being controlled by the dam upstream, it is extremely important to get on the river before the dam is closed. Please check the detailed Equipment List for what to wear and what to bring on this rafting trip. Group Specials For every 5 paid rafters the 6th goes for 50% off. For every 11 paid rafters the 12th goes for FREE. Groups of 12+ call us for a Special Group Pricing. NOTE: Youth prices are for ages 6 to 16. Prices are per person and there is an 8% Govt Land & River Use Fee added to all prices above.